In 1954 Teddy Daniels, a U.S. Federal Marshal and his partner are assigned to investigate a disappearance on a remote island off the coast of Boston. Known as Shutter Island, the cliff enclosed island houses a hospital for the criminally insane. Vying for some time to get on the island for personal reasons, Teddy Daniels intends to prove his suspicions, that the doctors on the island are performing illegal and horrific treatments on patients. "Shutter Island" does a powerful job of never allowing the viewer to completely wrap their imagination around what is unfolding in front of them. Even if for a moment you begin to think to are grasping the mystery within, the film easily plays another trick on your mind to further torment. The psychological horror directed by Martin Scorsese builds an uncanny suspense that resides all the way through the 138 minute film. The suspense is furthermore matched by a maddening score that compels the viewer on to the edge of their seat and further into the exceptional tale. Not only is "Shutter Island" imprisoned with tremendous suspense, the film is magnificently captured by director of photography, Robert Richardson. For instances, the viewer's first impressions of the island. Richardson captures the eeriness and magnitude of the island flawlessly. There is an imposing tension that builds from the moment Teddy Daniels (Leonardo DiCaprio) and his partner Chuck Aule (Mark Ruffalo) arrive on the island that perfectly sets up the rest of the mind bending ride. Aside from the enigmatic tone created by Richardson's cinematography and Laeta Kalogridis screenplay, "Shutter Island" also encompasses some breathtaking visuals that are awe inspiring. For spoiler reasons however, I will not discuss them here. As with any great film, the power of the story is absolute. Creating a truly compelling story is hard to do, but with a psychological horror, too many times the plot can become convoluted. Here in "Shutter Island" however, the lasting effect of the film stays with you. Director Martin Scorsese leaves certain aspects of the film open to interpretation, aspects that will get you talking about what just unfolded. I love when films can open up debate to specific moments or intentions and "Shutter Island" does not disappoint in that regard or any other for that matter. I want to talk for a moment about the unmarred cast. It has been a long time coming that Leonardo DiCaprio won me over in a role. This is his best work since his earlier roles in "This Boy's Life," "Basketball Diaries" or "What's Eating Gilbert Grape." After seeing the film, a peer said to me, DiCaprio felt as though he was channeling a young Jack Nicholson. While this thought did not dawn on me while watching the film, the comparison is validated in retrospect. DiCaprio brings his A game to the role of Teddy Daniels along with the rest of the cast. Mark Ruffalo who plays DiCaprio's partner, Chuck Aule, is polished once again. Ruffalo has always been an special actor in my eyes and as always he nails his performance. Max von Sydow, Ben Kingsley, Jackie Earle Haley, Emily Mortimer and Patricia Clarkson are also fantastic in their supporting roles. Michelle Williams also deserves a ton a credit for her portrayal of Daniels' wife Dolores. Williams has really grown into a impressive actress that deserves every bit of notoriety she is given. 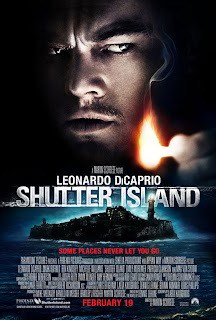 Overall "Shutter Island" is everything I had hoped for, but nothing of what I expected. The film had me completely fooled and in the best way possible. More often than not, I find myself trying to decode a mystery within a film, but here in "Shutter Island" I just went with it. Director Martin Scorsese does a fabulous job of breaking the mold from what we have come to expect from him over the years. So much so, that if I had not known going into the the film it was directed by Scorsese, I may have gasped at the sight of his name in the end credits.